I have been making this granola every month for 25 of the 27 years that Dr. Jerry and I have been married. It’s a staple at our house, a necessity that we always have in the pantry. We even give it to our neighbors at Christmas time! This recipe makes a big batch and stays fresh for at least 2-3 weeks, but we really can’t say because it has never lasted long enough to get stale. Preheat oven to 300° Adjust oven racks so that one rack is on the lowest setting and one rack is in the center. Place coconut oil into an oven safe glass dish. Place dish on a cookie sheet in the oven and allow oil to melt while preparing the other ingredients. 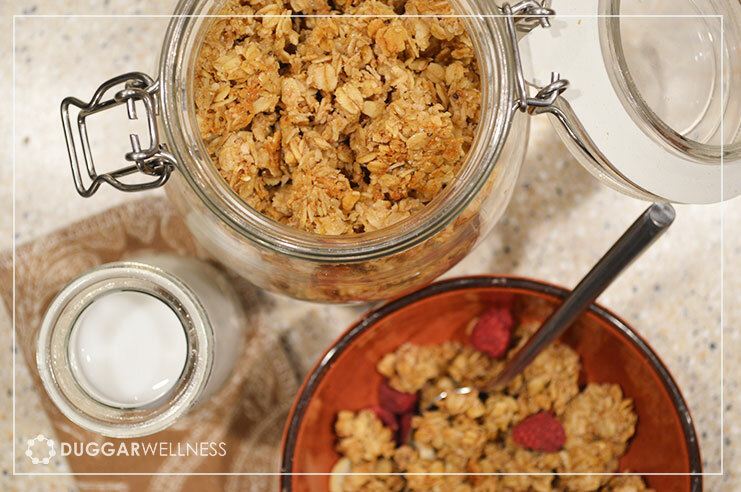 In a large bowl combine the oats, oat bran, cinnamon, sea salt shredded coconut and flax meal. In another bowl combine the vanilla, raw honey, maple syrup and unsweetened apple sauce. Stir until combined. Measure the coconut oil and stir into the liquid ingredients. Stir the wet ingredients into the dry ingredients until they are all coated. Line two baking sheets with parchment paper and spread the granola mixture evenly onto both sheets. Place both pans in the oven, one on each rack. Bake for 15-20 minutes. Remove from oven, stir granola and spread onto the pan evenly again. Place pans in the oven, put the pan that was on the bottom on the top this time. Bake for 15-20 more minutes. Allow to cool. Break apart and store in airtight container for 2-3 weeks. *Grind flax seeds using a coffee grinder to make flax meal. **Optional: After removing from oven add two cups total of raw seeds, nuts or dried fruit, stir together and allow mixture to cool.